Bax was musically prolific. Works poured from his pen with generous profusion from his early teens until the mid-1930s. There was something in his psychological make-up that made writing and invention quite natural and this was intensified by the fact that the material wealth of his family meant that distracting teaching or performing work could be avoided. The hardening of his creative arteries hit him all the harder when both productivity and quality began to falter and dry. Not for nothing did he call his frustratingly incomplete autobiography 'Farewell My Youth' (the Ashgate version has Lewis Foreman's invaluable annotations). When not lamenting the loss of youth or trying to recapture it he called down hard curses on old age. This is the second volume of the invaluable ASV two part series. The series is welcome not only for the excellence of its accomplishment but also because it starts and completes the work that failed with the older Chandos recording of the first and second sonatas (McCabe and Gruenberg). 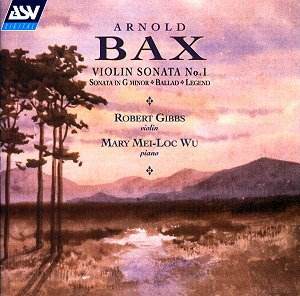 The Chandos disc should have been outstanding (after all McCabe has been a lifelong Baxian repeatedly performing and broadcasting Winter Legends, the sonatas and other solo piano pieces and Gruenberg performed the Bax Violin Concerto at the Proms in the early 1980s.). However the end results were curiously dry, artificial and uninvolving. The First Sonata is effusive, singing, full-lipped and rapturous. Magically still moments are also to be found as in the hooded contentment of the sighing epilogue of the last movement from 0900 to the end. While the First Sonata is alive with romantic feeling which speaks more directly than Ireland and with less starry complexity than Szymanowski, the single movement G minor sonata, written in his fourth term at the Academy, has the genteel mannerisms of Macdowell but already dowses these in romantic spirit quite beyond the Liszt pupil. This can be compared with the brusqueness, almost aggression, of the Legend which dates from February 1915 and which is informed both by the anger of the times (a characteristic not be taken for granted in works dating from the Great War years), by macabre visions and by an enigmatic yet eloquent romance. The Ballad dates from 1916 and by its tragic tone probably reflects the death of friends (and of dreams) in the Easter Rising. The piano part often echoes the sounds and effects of the bardic harp. This is darker music than the ballad episode in the first movement of the Violin Concerto (though listen to 5.58) and perhaps has something in common with the dark-side reflected in the powerful Second Northern Ballad (for orchestra). It is strong on atmosphere but lacks the highest melodic qualities in the Legend and First Sonata. The Ballad is a work in which Bax communes most closely with himself, both magnifying emotions which are close to lachrymose and applying balm and comfort. This together with the Irish connection (with its overtones of intense privacy) explains why the work disappeared until its revision and publication in 1929. The notes are provided by Lewis Foreman, Bax's biographer and long-time champion rivalled only by Colin Scott-Sutherland, with the depth that comes of a lifetime's study and dedication to the Bax cause. I greatly admire the steady tone and sensitively imaginative treatment that both artists bring to these works. Bax is well served indeed.